Lalu Yadav is already in Delhi, where his son and Bihar's leader of opposition, Tejashwi Yadav, has been camping out since the last week. Patna/New Delhi: Bihar's veteran politician Lalu Yadav will be interrogated today by the Central Bureau of Investigation or CBI, which is investigating the multiple corruption cases against the family. Mr Yadav is already in Delhi, where his son and Bihar's leader of opposition, Tejashwi Yadav, has been camping out since the last week. The agency is expected to submit a chargesheet in the case next month. The interrogation will be in connection with three acres of land in Patna where a mall was being built. It was at the heart of the controversy over which Nitish Kumar ended his alliance with Lalu Yadav and the Congress in July. Mr Yadav had allegedly got the land from companies - a return for the favours they received during his tenure as the railway minister. One of the alleged beneficiaries of the property was Tejashwi Yadav. Mr Yadav has come directly from Ranchi, where he spends nearly three days every week in connection with the trial in several fodder scam cases. The former Chief Minister of Bihar has been convicted in one of the cases, which has barred him from contesting elections or holding public office for six years. Tejashwi Yadav, whom Lalu Yadav had put in place as Chief Minister Nitish Kumar's deputy during the Grand Alliance government, will be questioned on Tuesday. He has been named as one of the conspirators in the case. The Yadav Junior has claimed he was very young when the land was acquired. The Grand Alliance fell through after the BJP allegations of corruption against Lalu Yadav and his family, which snowballed after the mall building started. Nitish Kumar pulled the plug on the alliance - formed to beat the BJP in the 2015 assembly elections - after Lalu Yadav refused to have his son resign from his post of number 2 in the government. 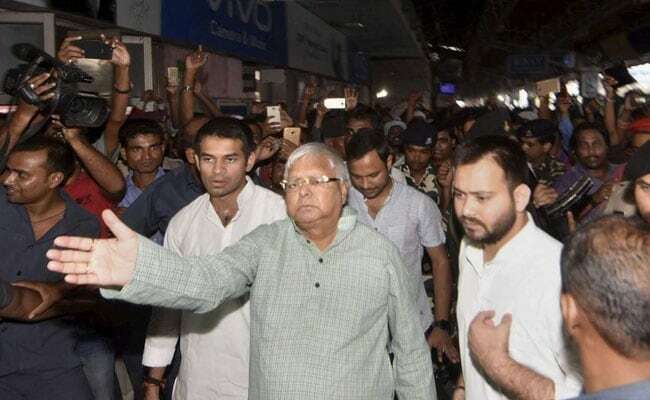 As Mr Kumar was back within hours at the head of a new government formed with the BJP, Lalu Yadav's party claimed the tie-up was Mr Kumar's target all the time and Tejashwi Yadav had been made the scapegoat. The scam had been brought into public notice for the first time by Nitish Kumar's Janata Dal United in 2008. At the time, two JD(U) lawmakers - Sharad Yadav and Lallan Singh - had met then Prime Minister Manmohan Singh and submitted the documents which, they said, were evidence. At the time, the land was in the name of Delight Marketing, a company that belonged to the wife of RJD leader Prem Gulta.